Improving fuel efficiency means making enhancements all over. Like the transmission and efficient engine that help to enhance EPA mpg estimates and earn an Ultra Low Emission Vehicle II (ULEV-II) rating. When the road gets adventurous, Highlander embraces it with available Dynamic Torque-Control All-Wheel Drive (AWD). It distributes engine power from front to rear and manages the vehicle’s braking system from side to side, giving you better control. Highlander Hybrid Limited has Electronic On-Demand AWD with intelligence (AWD-i). 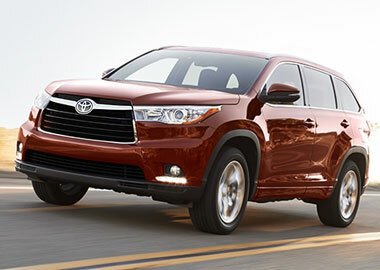 The 2015 Highlander was designed with excitement in mind. A bold, aggressive grille aids airflow, while the available LED Daytime Running Lights (DRL) add style and visibility. And its Chromtec® roof rails are integrated, which means when you aren’t using them to carry your accessories, their aerodynamic shape minimizes the noise coming from overhead. 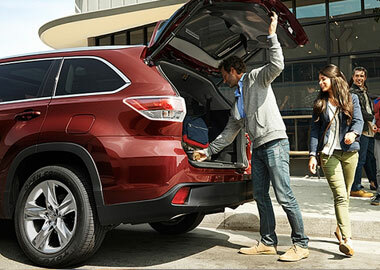 This available feature allows you to open the rear liftgate and adjust how high it opens with the press of a button. If you have a garage with low clearance or a covered parking spot, you know how much this matters. And there’s no need to open the entire liftgate to quickly grab something small. Just use the available flip-up rear hatch window for easy access. Even the wheels were designed to turn heads. Highlander Limited looks sharp with 19-in. 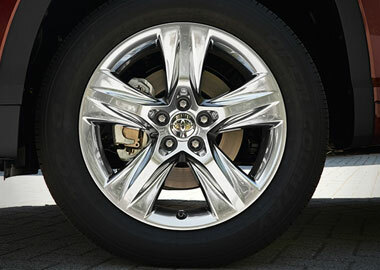 Chromtec® wheels, XLE and LE Plus have unique 18-in. machined-face 5-spoke alloys, and LE features a stylish 5-spoke alloy wheel. Keep the discussion going with the standard conversation mirror located above the rearview mirror. It allows you to quickly glance back to those in the rear seats, and as an added bonus, it also conceals a storage compartment for sunglasses. Entertaining from the driver's seat is tough. Let the available Blu-ray Disc™ rear-seat entertainment system help. The 9-in. display screen comes with RCA jacks, remote and two wireless headphones. Entune™ Audio with Intelligent Touch controls comes standard on Highlander. With Bluetooth®, connectivity, SiriusXM® All Access Radio, HD Radio™, and a 6.1-in. or 8-in. touch-screen display, Highlander puts tech at your fingertips. And with the available Entune® App Suite, you can listen to music, buy movie tickets and make restaurant reservations using the touch-screen display. You can also get gas prices and access information on stocks, sports, traffic and weather. Exciting to drive and help keep you safe. Highlander and Highlander Hybrid have been recognized for their high levels of safety by being named an IIHS Top Safety Pick Plus when equipped with an available pre-collision system. Both vehicles not only are designed to help protect you in a crash, but also to help you avoid one. Because every adventure should be a safe one. When brakes get too hot, they can become less effective. It’s called brake fade, and it’s a surprise no driver wants. To help prevent it, Highlander’s front brakes use a ventilated disc design, which helps to dissipate heat and ensure confidence in the vehicle’s stopping power.